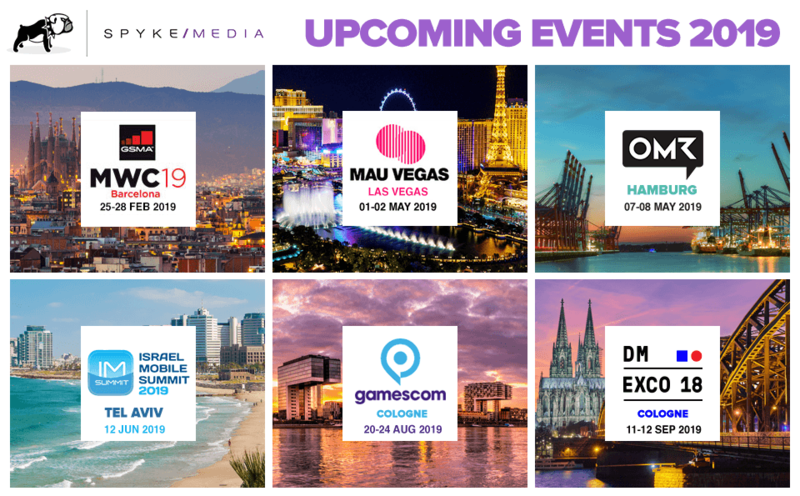 Meet Spyke Media at these Mobile Industry events in 2019! The year 2019 is fresh, yet it’s never too early to take a look ahead and make plans for what’s to come. And there’s a lot in store for the mobile industry event-wise. We at Spyke Media, after a wonderful year 2018 in which we celebrated our 5th birthday, will be out and about again this year. Here are the highlights planned for so far. Get in touch for a meeting asap! From 25 to 28 February we’ll have a sizeable team present at the mobile industry’s premier trade show, held annually in the beautiful city of Barcelona: Mobile World Congress is the vast, world-moving event that so many flock to from all over the world that it’s always a challenge to get your schedule well organized and know where to head next. Make sure to meet with our team for mobile performance trends (such as Apple Search Ads). We think the conference part is always worth stopping by. This year, Daimler chairman Dieter Zetsche will take the stage, as will Microsoft CEO Satya Nadella and Vimeo CEO Anjali Sud. In May, we’ll again fly over to Las Vegas for the 2019 edition of MAU, also known as the world’s leading mobile acquisition and retention summit. MAU is the acronym for Mobile Apps Unlocked, so the event really focuses on the things we care about the most. The event is not so much an industry trade show to pass around business cards as it is an actual platform for inspiration and in-depth discussions with some of the mobile industry’s leading minds. We’ll be at MAU in Las Vegas on 1 and 2 May. The title of this event matches its great success: Online Marketing Rockstars, held on 7/8 May in Hamburg, is a shooting star kind of industry meet-up and exhibition. OMR celebrates the stars of international digital marketing, such as Erin Patton, architect of the (Air) Jordan Brand, Headspace Founder Andy Puddicombe and Sara Urbainczyk of echtemamas.de. Here, online marketing goes beyond the business part and becomes lifestyle, art, and party. On 12 June 2019, Tel Aviv sees one of the most influential mobile app-related events in the EMEA region. More than 2,000 apps professionals come together in the Israeli metropolis to network, talk business and attend numerous industry specific satellite events. The event features 4 main tracks: Innovation & growth, monetization & games, mobile advertising and user acquisition & traffic. “At the heart of gaming” and proven to be an industry-inspiring festival of gaming culture, Gamescom – held in our hometown Cologne on 20 to 24 August – is one of the gaming industry’s most fascinating events globally. Gamescom mixes a spacious “serious” business part with room for a real mass event. In 2018, the trade show drew 370,000 people to attend and check out the latest new games and necessary hardware add-ons. Of course, mobile games and apps take up more and more of the attention. Established for years now as the hub for movers and shakers of the digital marketing industry, dmexco in Cologne is of course one of the most important events in our calendar. We take pride not only in our strong presence at the fair proper, but we also organize a lot of attractive pre- and side action. Stay tuned for more to come.